CAFE/CAFÉ – A coffeehouse, coffee shop, or coffee vending shop, or other establishment that centers around the offerings of espresso-based specialty coffee drinks (espresso drinks) and also often offers tea, hot chocolate, and other specialty beverages. Many cocasffeehouses also sell croissants, bakery products, light desserts, and various treats. A café typically has some of the characteristics of a restaurant and some of the characteristics of a bar, though usually alcoholic beverages are not offered. See Espresso Drink Recipes; Espresso Cuisine. CAFE AU LAIT (Café Au Lait) – See Espresso Drink Recipes. CAFE BONBON (Café Bonbon) – See Cafe Bombon Recipes. CAFECITO (Un Cafecito) – See Cafecito Recipes. CAFE CON LECHE (Café Con Leche) – See Cafe Con Leche Recipes. CAFE CUBANO – See Espresso Drink Recipes. CAFE DECAFFEINE – See Espresso Drink Recipes. CAFE MOCHA (Café Mocha) – See Espresso Drink Recipes. CAFE NOISETTE – See Espresso Drink Recipes. CAFETERO – Colombian coffee farmer. Also see Colombian Coffee. CAFETIERE – A coffee brewing method and also the name of the piece of coffee equipment (a coffee maker) that allows coffee grinds to soak directly in hot water. The spent grounds are then separated from the brewed coffee by pushing a mesh plunger to the bottom of the cafetiere. The cafetiere, or French Press, is widely considered as the best method for brewing gourmet coffee and enjoying all of its best qualities (e.g., body, aroma, acidity, aftertaste, bitterness, sweetness). A typical cafetiere coffee maker is a cylindrical glass container with a round, metal screen filter/plunger which is tightly fitted to the cylinder. To brew the coffee, first remove the mesh plunger from the cafetiere and place the ground coffee in the bottom of the glass container. Generally a course coffee grind size is used in the cafetiere method. Next add the hot water, and then perhaps stir or shake it just a bit. Because the cafetiere method does not filter the coffee through a paper filter, the coffee’s volatile oils are not removed, and this helps the coffee retain its natural body. The cafetiere method is also the best brewing method for controlling the coffee’s brewing temperature and brewing time. After about three to five minutes the cafetiere coffee will be ready. At this time you may push the mesh plunger down, forcing the water through the screen mesh to separate the extracted coffee from the coffee grounds. The cafetiere is also called Bodum, French Press, or Plunger Pot. CAFFE AMERICANO (Caffé Americano) – See Espresso Drink Recipes. CAFFE CREME (Caffè Creme) – See Espresso Drink Recipes. CAFFEINE – A crystalline, white, bitter alkaloid substance occurring naturally in coffee beans, cocoa beans and tea leaves. When consumed, caffeine has the effect of stimulating the central nervous system. The amount of caffeine in a cup of coffee depends on the type of coffee beans used, the coffee grind size, and the coffee brewing methods. A typical 5 ounce cup of coffee has about 110 milligrams of caffeine, while a cup of decaffeinated coffee (in the United States) usually has less than 5 milligrams. CAFFE LATTE (Caffè Latte) – See Espresso Drink Recipes. CANEPHORA COFFEE – Canephora is a coffee plant species (Coffea canephora), a variety of which is called Robusta (Coffea canephora var. robusta), one of the two main commercially cultivated coffees along with Arabica (Coffea arabica). A relatively small about of Liberica Coffee (Coffea liberica) is also grown commercially. Botanically Canephora is a self-sterile, diploid coffee plant with two main recognized forms of cultivars: Robusta (an upright form) and Nganda (a spreading form). Robusta coffee beans are used for most instant coffees, and contain about twice as much caffeine as Arabica coffee beans. Many of the world’s largest commercial coffee roasters use large quantities of Robusta coffee beans. Most coffee plants grown (about 70%) are Arabica, while Robusta coffee plants comprise only about 25% of the world’s commercially grown coffee. Robusta coffee plants are easier to grow (e.g., more “robust”) because they tolerate less favorable soil and climate conditions and grow at lower elevations. See Robusta Coffee for a complete description. Also see Arabica Coffee; Liberica Coffee. CAP – The bed of coffee grounds that rises to the top of a cup of brewed coffee during a traditional coffee cupping (professional coffee tasting) after hot water is poured directly atop the coffee grinds typically in a small glass or porcelain cup. After the near-boiling water is poured atop the coffee it is allowed to steep for about four minutes as the coffee grinds rise to the top and form a thick crust. At this point the professional coffee taster checks for any rancid or sour smells. The next step is to gently break the crust with a spoon. Silver-plated spoons are preferred for this as steel may impart an unwanted taste to the coffee. The spoon is placed horizontally in front of the face and near the front lip of the cup. The spoon is then used to push the crust toward the back of the cup. The cupper then pushes the grinds back and inhales the coffee’s vapors and gases – the volatile organic compounds – and proceeds to evaluate the coffee’s aromatic bouquet. At this point the cupper also looks for a layer of fine-celled foam atop the coffee, and if this layer is lacking it might indicate that the coffee is not fresh. The coffee grinds are then either removed or allowed to sink to the bottom of the cup. Then the coffee is slurped with the spoon to properly evaluate the coffee’s flavor and aromatic qualities as well as the acidity, sweetness, bitterness, body (mouthfeel) and aftertaste. The cap is also called the crust. CAPPUCCINO – See Espresso Drink Recipes. CAPRESSO – See Coffee Companies. CAPULIN – See Mexican Capulin Coffee. CARACAS COFFEE – A Venezeuelan class of coffees whose quality ranges from fair to excellent. Also see Venezuela Coffee. CARAMEL (CARAMELLY) – An aromatic sensation (aroma descriptor) and sweet taste created by the coffee’s moderately volatile set of sugar carbonyl compounds which produce flavors suggesting a caramelly, syrupy candy taste. The caramelly aroma and flavor is similar to that produced by caramelizing sugar (but not burning it). CARAMELIZATION – The process that occurs during a certain stage of coffee roasting when simple sugars in the coffee beans are heated to a particular temperature, creating a caramel flavor and color. 1. Describes coffee beans that are dipped in sugar, syrup, dextrin, or molasses before they are roasted. CARBON DIOXIDE (CO2) – A gas that forms in coffee beans during the roasting process; a natural byproduct of coffee roasting. Also see Degassing. CARBON DIOXIDE METHOD OF DECAFFEINATION (Carbon-Dioxide Method) – See Carbon Dioxide Method of Decaffeination. CARBONY – A charcoally, burnt flavor and/or aromatic sensation notable in most dark-roasted coffees. The cause of the carbony flavor quality is heterocyclic compounds that are slightly volatile and thus are particularly noticeable in the coffee’s finish/aftertaste. This carbony taste may be reminiscent of a creosol-like substance. CASCARA – the dried coffee cherry used to make a cascara latte. CATIMOR COFFEE – A Coffea arabica coffee plant varietal (Coffea arabica var. catimor) was developed in 1959 in Portugal. Catimor is a cross between the Caturra varietal (Coffea arabica var. Caturra) and Timor coffee (a hybrid of Coffea canephora var. robusta and Coffea arabica). Catimor coffee plants, which are known for their resistance to coffee rust (Hemileia vastatrix), when grown at low elevations and are not distinct from other commercial coffee varietals, though the Catimor plants grown at elevations above 4,000 feet exhibit a much higher quality. The Catimor varietal produces among the highest yields of commercial coffee plants. The cherry (fruit) mature early on the coffee plants, and thus farmers cultivating the Catimor varietal must closely monitor the shade and fertilization of the plants. There are three main lines of Catimor, and each has different characteristics: the Catimor T-5175 line does not grow well at too low or high of an altitude, but otherwise is a robust and very productive coffee plant; the Catimor T-5269 line grows well between 2,000 and 3,000 feet in places where rainfall reaches at least 3,000 mm each year; and the Catimor T-8667 line has large seeds (coffee beans) as well as fruit (cherry), though the plant itself is quite small. CATUAI COFFEE – A high yielding Arabica coffee plant varietal (Coffea arabica var. catuai) that is a cross between two other varietals: Caturra (Coffea arabica var. caturra) and Mundo Novo (Coffea arabica hybrid mundo novo). Catuai was developed in the late 1940s in Brazil. The Catuai plant is relatively short with lateral branches that form tight angles with the main branches. Catuai plants require a certain amount of care and fertilization. Catuai is a popular varietal in areas often subjected to inclement weather because the fruits (cherry) do not fall off easily during rains and winds. CATURRA COFFEE – A Coffea arabica coffee plant varietal (Coffea arabica var. caturra) that is a mutation of the Bourbon varietal (Coffea arabica var. bourbon). Caturra was discovered in Brazil in the 1930s near the town of Caturra. Caturras are fast-maturing coffee trees with good production, and are better at resisting coffee diseases and pests than many other Arabica Coffee varietals. However, Caturra coffee plants do require extensive fertilization and care. The quality of the cup of brewed coffee produced by Caturra and other modern hybrids of Coffea Arabica are generally considered to be inferior to the more traditional Coffea arabica varietals known as the “old Arabicas” including Bourbon (Coffea arabica var. bourbon) and Typica (Coffea arabica var. typica). Caturra plants have an abundance of secondary branches and a relatively thick main stem. Like Bourbon, Caturra leaves are rather large and have wavy edges. Caturra plants are known to grow well in a variety of conditions though they are best suited to elevations ranging from 1,500 feet to 5,500 feet above sea level and rainfall amounts that average around 3,000 mm per year. Caturra plants grown at higher elevations yield less coffee but that coffee is of a higher quality than the lower elevation plants. Caturra coffee plants produce a higher yield than Bourbon plants, mostly because there is less distance between the Caturra plant’s branches. The Caturra varietal is quite similar to Bourbon varietal genetically, yet the quality and distinction of the brewed coffee of Caturra is generally considered to be lower than Bourbon. The Caturra mutation also led to Costa Rica’s Villa Sarchi varietal (Coffea arabica var. villa sarchi) from Coffea arabica var. bourbon and El Salvador’s Pacas varietal (Coffea arabica var. pacas) from Coffea arabica var. bourbon. CAUSTIC – An undesirable coffee flavor characteristic that produces a burning, sour taste sensation on the posterior (back) sides of the tongue. This caustic quality is created by alkaloids that increase the sourness of the coffee’s acids in conjunction with a relatively high percentage of salts in the coffee. CAMEROON CHARRIERIANA COFFEE – Thought to be a Coffea arabica coffee plant varietal (Coffea arabica var. charrieriana), Charrieriana was recently discovered in Cameroon. Though the plant is not yet commercially cultivated, Charrieriana may gain a wider appeal in the future due to the plant’s lack of caffeine. CARACOL/CARACOLILLO COFFEE BEAN – A caracol or caracolillo coffee bean (the Spanish word for “little snail”) results from a coffee cherry (fruit) producing just one relatively round (football-shaped) seed (bean) as opposed to the usual two half-beans which are roundish on one side and flat on the other side. Caracol coffee beans are typically separated from the rest of the coffee crop and sold as a higher grade of coffee bean. From one to nine percent of any crop are caracol, and they are said to have a higher density and more concentrated, robust flavor, rich aroma and with a distinct acidity – brighter yet lighter – than non-caracol coffee beans from the same crop. The distinct qualities of caracol coffee beans may be due to the beans getting more nutrients from the coffee tree while developing within the coffee cherry (fruit). CATIMOR T-5175 COFFEE – One of the three main lines of the Catimor coffee plant varietal (Coffea arabica var. catimor). The Catimor T-5175 line does not grow well at too low or high of an altitude, but otherwise is a robust and very productive coffee plant. Also see Catimor Coffee. CATIMOR T-5269 COFFEE – One of the three main lines of the Catimor coffee plant varietal (Coffea arabica var. catimor). The Catimor T-5269 line grows well between 2,000 feet and 3,000 feet above sea level in places where rainfall reaches at least 3,000 mm each year. Also see Catimor Coffee. CATIMOR T-8667 COFFEE – One of the three main lines of the Catimor coffee plant varietal (Coffea arabica var. catimor). The Catimor T-8667 line has large seeds (coffee beans) and fruit (cherry), though the coffee plant itself is quite small. Also see Catimor Coffee. CBD – See Coffee Berry Disease. CC – A unit of measurement equal to one one-thousandth of a liter; also written as ml, or milliliter. This unit of measurement is often used in Europe for boiler sizes of espresso machines (espresso coffee makers). 100 cc is about 3.38 U.S. fluid ounces. CCC – See National Federation of Coffee Growers of Colombia. C COFFEE BEANS – See Kenya C Coffee Beans. CELEBES COFFEE – The most distinguished Celebes coffee (also called Sulawesi Coffee) is Toraja, a multi-dimensional coffee grown in the southeastern highlands and distinguished by its full body and rich flavor. A good Toraja coffee is well-balanced with undertones of ripe fruit and dark chocolate, usually with a relatively low-toned yet vibrant acidity, though usually slightly more acidic and with less body than Sumatran coffees and also more earthy than Java Arabica. Like Sumatran coffees, the cup profile of Toraja has been called deep and brooding, and the fruit notes are often muted. Also see Sulawesi Toraja Coffee; Indonesia Coffee. CELEBES TORAJA KALOSSI COFFEE (Indonesia Sulawesi Toraja Kalossi Coffee; Celebes Toraja Coffee) – See Sulawesi Toraja Coffee. CELLULOSE MATERIAL – The fibrous plant tissue that comprises much of a coffee bean’s cell walls, totaling about three-fourths of the bean’s total weight. CENTRAL AMERICAN CATURRA COFFEE (Central America Caturra Coffee) – A Coffea arabica coffee plant varietal (Coffea arabica var. caturra) that is a mutation of the Bourbon varietal (Coffea arabica var. bourbon). Caturra was discovered in Brazil in the 1930s near the town of Caturra and later planted in Central America. Though Caturra coffee plants require extensive fertilization and care, they are fast-maturing with good production, and also better at resisting coffee plant diseases and pests than other Arabica varietals. The quality of the brewed coffee produced by Caturra (as well as other modern hybrids of Coffea Arabica) is generally considered to be inferior to more traditional varietals of Coffea Arabica – e.g., the “old Arabica” varietals Typica (Coffea arabica var. typica) and Bourbon (Coffea arabica var. bourbon). Caturra plants have a relatively thick main stem with a relatively high number of secondary branches. Caturra leaves, like Bourbon leaves, are rather large and have wavy edges. Caturra plants are known to grow well in a variety of conditions though they are best suited to elevations ranging from 1,500 to 5,500 feet above sea level and rainfall amounts that average around 3,000 mm per year. The higher the elevation, the lower the production of Caturra plants, though the quality of the beans increases. Caturra coffee plants produce a higher yield than Bourbon coffee plants yet this is mostly due to the smaller distance between the branches. The Caturra varietal is quite similar to Bourbon genetically, yet the quality and distinction of the brewed coffee is generally considered to be lower than Bourbon. The Caturra mutation also led to El Salvador’s Pacas varietal (Coffea arabica var. pacas) from Coffea arabica var. bourbon and Costa Rica’s Villa Sarchi varietal (Coffea arabica var. villa sarchi) from Coffea arabica var. bourbon. CENTRAL STANDARD COFFEE – A grade of Honduras coffee based upon the altitude at which the coffee was grown. Also see Strictly High Grown Coffee; High Grown Coffee. CEREAL – A coffee aroma descriptor (aromatic sensation) suggesting a malty or toast-like aroma; grain-type aroma and/or flavor (e.g., barley, wheat, corn, freshly baked bread, toast, malt extract). This cereal impression is typically a process taste. CERRADO COFFEE – See Brazil Cerrado Coffee. CERTIFIED ORGANIC COFFEE – See Certified Organic Coffee. 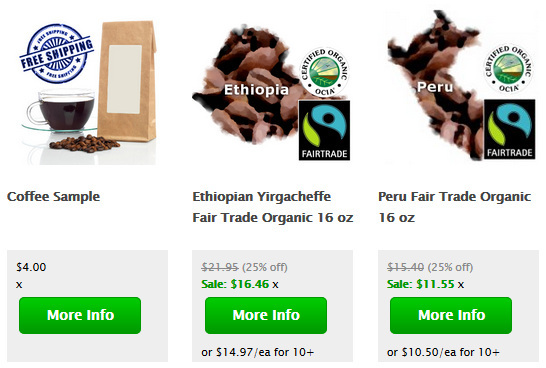 CERTIFIED ORGANIC COFFEE (USDA) – See USDA Certified Organic Coffee. CHAFF – Brownish fragments (remains) of the coffee bean’s paper-thin silverskin (the innermost skin) which clings to the coffee beans even after all the normal processing (hulling, milling, and drying) is completed. This silverskin comes off naturally as brownish fragments during the roasting process. Though some coffee processors remove the chaff from the green coffee beans (milled but not yet roasted coffee beans), others leave the chaff on the beans as a protective barrier until the coffee beans are roasted. CHANCHAMAYO HIGH GROWN COFFEE (Chanchamayo High Grown Coffee; Chanchamayo High-Grown Coffee; Chanchamayo Coffee) – See Peru Chanchamayo High Grown Coffee. CHARRIERIANA COFFEE – Thought to be a Coffea arabica coffee plant varietal (Coffea arabica var. charrieriana), Charrieriana was recently discovered in Cameroon. Though it is not yet commercially cultivated, Charrieriana coffee it may soon gain a wide appeal due to its lack of caffeine. CHERRY – See Coffee Cherry. CHIAPAS COFFEE – See Mexican Chiapas Coffee. 1) The root of the endive plant. Chicory is sometimes roasted, ground up, and brewed like coffee. Some people prefer to drink the chicory beverage straight, while others like to blend it with coffee. See New Orleans Coffee. 2) A coffee flavor characteristic/taste sensation that is reminiscent of chicory, the root of the endive plant and may be described as a sweetish yet bitter–acid, complex taste. CHIPINGE (Chipinga) – See Zimbabwe Chipinge Coffee. CHLORINATED HYDROCARBON SOLVENTS – Chemical solvents which are used to remove caffeine from green coffee beans (milled but not yet roasted). After these solvents are removed, the coffee beans are then roasted in the usual manner. This process of decaffeination was used almost exclusively until the 1980s. 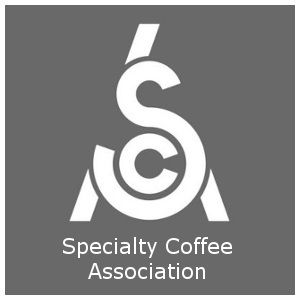 Due to residual dichloromethane in the coffee as a result of using this decaffeination process, non-chemical methods of decaffeination began to be more widely used and today most decaffeination is done by other methods. Also see Decaffeinated Coffee. CHOCOLATY (Chocolate-Like) – An aroma and/or aftertaste descriptor that suggests unsweetened chocolate (including dark chocolate and milk chocolate), cocoa powder, or vanilla; roasty and sweet. This aromatic coffee flavor characteristic/taste sensation is attributed to volatile pyrazine compounds in the coffee’s finish. CINNAMON ROAST – This very light roast is lighter than an American Roast, and is also called New England Roast and is often used by cuppers (professional coffee tasters) to help them discern the finer qualities of the coffee beans. The stop temperature of a Cinnamon Roast is about 420 degrees Fahrenheit when the color is light cinnamon brown. The flavor of a Cinnamon Roast may be nut-like and with a distinct acidity. Also see Roasting Coffee. CIB – See Coffee Industry Board of Jamaica. CIBAO COFFEE – See Dominican Republic Cibao Altura Coffee. CIBAO ALTURA COFFEE – See Dominican Republic Cibao Altura Coffee. CINNAMON – An aroma reminiscent of cinnamon; spicy. CITY ROAST – The stop temperature of a City Roast is from 430 degrees to 435 degrees Fahrenheit. This is the lightest commercial roast. Also see Medium Roast; Roasting Coffee. CIVET COFFEE – See Civet Coffee. CLASSIC BREWING – Brewing coffee using a controlled level of extraction which removes about 20% of the soluble material from the roasted, ground coffee. CLEAN – Describes a pure coffee flavor with no changes or twists in the mouth and no different aftertaste; a graceful finish that is smooth and clear with a flavor that is not dry; no off-flavors or taints. CLR – See Coffee Leaf Rust. CO2 (Carbon Dioxide) – A gas that forms in coffee beans during the coffee roasting process; a natural byproduct of coffee roasting. Also see Degassing. CO2 WATER DECAFFEINATION PROCESS/SPARKLING WATER DECAFFEINATION PROCESS – In the Carbon Dioxide Process of decaffeinating coffee, green coffee beans (milled but not yet roasted) are soaked in supercritical carbon dioxide (highly compressed carbon dioxide) at 73 to 300 atmospheres of pressure for about ten hours, which extracts the caffeine from the coffee beans. Then the pressure is reduced and the CO2 either evaporates or goes through water (in the Sparkling Water Process) or activated carbon filters (in the Carbon Dioxide Process) to eliminate the caffeine. The CO2 is then used again. The supercritical state of carbon dioxide is superior to water in this process because it has the desirable diffusive properties of a gas yet an increased density like a liquid. An advantage of this decaffeination method is the avoidance of the use of potentially harmful chemical solvents. The CO2 Water process of decaffeination is also called the Supercritical Fluid Extraction Process; Sparkling Water Process; and the Carbon Dioxide Method with variations. COATEPEC COFFEE – See Mexican Altura Coatepec Coffee. COBAN COFFEE – See Guatemala Coban Coffee. COCONUT LATTE – See Espresso Drink Recipes. COFFEA ARABICA – This is a coffee plant species in the genus Coffea. The scientific classification Coffea arabica was first given to this coffee plant species by the European botanical expert Linnaeus, who categorized all the flora on the Arabian peninsula. Among the world’s gourmet coffees, Arabica beans are by far the coffee beans of choice due to their tendency to produce coffees with a good body and a rich flavor. About 70% of all coffee beans grown are Arabica beans. Most of the rest are Robusta (Coffea arabica var. robusta), the other main coffee grown commercially along with a relatively small amount of Liberica (Coffea Liberica). Though Arabica coffee bean are generally more flavorful than Robusta (which has about twice as much caffeine) not all premium gourmet coffee beans are Arabica. The Arabica coffee plant species is grown almost exclusively in sub-tropical and tropical climates at altitudes above 2,000 feet above sea level, with most of the finest Arabica grown between 4,000 and 6,000 feet above sea level. Arabica plants are the first cultivated species of coffee plant. Arabica coffee plants are now cultivated around the world including East Africa and Central Africa, all throughout Latin America, in India, and also Indonesia. Arabica coffee plants have dark green, oval-shaped leaves and oval fruits (cherry) that take about 8 months to ripen. The Arabica species is genetically distinct in that it has four sets of chromosomes instead of two. Arabica coffee is more expensive to produce than Robusta coffee for numerous reasons including being more vulnerable to coffee plant diseases and pests, and more difficult to grow than Robusta. Arabica coffee plants are also more sensitive to temperature and handling, and yield a smaller harvest per acre than Robusta plants. Arabica plants also require more care and hand-cultivation, and are usually harvested by hand picking. Harvesting occurs periodically throughout the fall and winter months as the cherry (fruits) ripen. Before they are roasted, Arabica coffee beans often have a smell similar to blueberries. Once they are roasted Arabica beans give off a sweet fragrance. Some of the most distinguished Arabica Coffees are Bourbon (Coffea arabica var. bourbon) and Typica (Coffea arabica var. typica), from which many culitvars and strains have been developed. Also see Robusta Coffee; Liberica Coffee. COFFEA ARABICA HYRBID MUNDO NOVO – A Coffea arabica coffee plant varietal commonly called Mundo Novo. The varietal Mundo Novo is known for its strength and disease resistance. Discovered in Brazil in the 1940s, Mundo Novo is a hybrid of the Bourbon (Coffea arabica var. bourbon) and Typica (Coffea arabica var. typica) varietals. Mundo Novo is now grown throughout Latin America. The varietal Catuai (Coffea arabica var. catuai) is a cross between Mundo Novo and Caturra (Coffea arabica var. caturra). COFFEA ARABICA HYBRID PACAMARA – A hybrid between Maragojipe (Coffea arabica var. maragojipe) and Pacas (a Typica mutation – Coffea arabica var. pacas) commonly called Pacamara. First bred in 1958 in El Salvador, Pacamara is thought to have been developed in order to create a variety of Typica with larger coffee beans. COFFEA ARABICA HYBRID PACHE COLIS – A Coffea arabica coffee plant varietal commonly called Pache Colis and distinguished by its large fruits (cherry), rough-textured leaves, and secondary as well as tertiary branching. Pache colis grows best at temperatures around 20 degrees Celsius at elevations between 3,000 feet and 6,000 feet above sea level, and usually reaches heights between .8 and 1.25 meters. Pache colis was first discovered on a farm in Mataquescuintla, Guatemala where Pache comum and Caturra coffee plants were growing, and thus Pache colis is an Arabica hybrid between those two varietals. Pache colis also has the desirable quality of being somewhat resistant to the coffee disease called phoma, which is caused by a genus of soil fungi. COFFEA ARABICA VAR. AMARELLO – A Coffea arabica coffee plant varietal commonly called Amarello. The varietal Amarello produces yellow fruit and is not widely planted. COFFEA ARABICA VAR. BLUE MOUNTAIN – Blue Mountain is a Coffea arabica coffee plant varietal (Coffea Arabica var. blue mountain) which is a natural mutation of the Typica varietal and thrives at higher altitudes. Blue Mountain is very resistant to coffee berry disease. Jamaica’s Blue Mountain Region is south of Port Maria and north of Kingston with coffee-growing estates located at elevations between 3,000 feet and 5,500 feet above sea level. This unique growing region features an ideal coffee-growing terrain and climate, and contains some of the highest coffee-growing areas in the Caribbean. A sophisticated coffee grown in the Blue Mountain District of Jamaica, Jamaica Blue Mountain is a wet processed (washed) coffee that is silky smooth and well-balanced. Blue Mountain provides an excellent full body with a refined and classic mild taste that has a slightly (and unusually) sweet flavor, very rich and sometimes almost creamy, a complex taste that is sometimes almost chocolaty and has also been described as similar to beef-bouillon. A good Jamaica Blue Mountain coffee, despite how smooth and mild it tastes, exhibits a vibrant and bright though smooth acidity, a clean taste with virtually no bitterness, and a bold yet sparkling aroma with a profusion of floral notes along with sweet herbal and nutty overtones. At its best, Jamaica Blue Mountain coffee produces the quintessential cup of coffee that is widely regarded as one of the world’s finest premium gourmet coffees. A City Roast or Full City Roast is recommended for Blue Mountain, as it will free the beans’ flavors and fragrances without losing the finer qualities. The first place coffee plants were cultivated in Jamaica was in the foothills of St. Andrew. Eventually cultivation of the plants extended into the Blue Mountains where they responded well to the unique climate and soil conditions. Eventually the coffee plants developed into a distinct coffee plant varietal now known as Coffea Arabica var. blue mountain, commonly referred to simply as Blue Mountain. COFFEA ARABICA VAR. BERGENDAL – A coffee plant varietal of Coffea arabica var. typica commonly called Bergendal. The varietal Bergendal survived the renowned 1880 coffee leaf rust outbreak which destroyed most all Typica plants in Indonesia. COFFEA ARABICA VAR. BOURBON – A coffee plant varietal commonly called Bourbon that has a yield that is less than many other varietals, though it is still about 25% greater than the yield of the Typica varietal (Coffea arabica var. typica). Like Typica, the Bourbon varietal produces an excellent brewed coffee known for its smooth and mild flavors (often sweet and nutty) with a light to medium body, low acidity, and nice aroma. The first Coffea arabica varietals are thought to be Bourbon (Coffea Arabica var. bourbon) and Arabica (Coffea arabica var. arabica), and virtually all other varietals are thought to have originated from these two varietals, including the popular Arabica variety called Typica (Coffea arabica var. typica) derived from Coffea arabica var. arabica. Bourbon coffee plants grow in a shape less conical than Typica and have more secondary branches, which grow at less of an angle than Typica branches and also closer together off the main coffee plant stem. Bourbon coffee plants grow best at elevations between 3,500 feet and 6,500 feet above sea level. The broad leaves of the Bourbon coffee plant varietal have wavy borders and the fruits (coffee cherry) are very dense and relatively small compared to many other varietals. The coffee cherry ripen rather quickly and fall off the plant fairly easily, making the plants vulnerable to weather and wind. The Bourbon varietal originated after the French first planted the parent stock in 1708 in Bourbon (now Reunion Island), which is located in the middle of the Indian Ocean. The coffee plant then underwent a slight mutation, creating the Bourbon varietal. Bourbon was planted throughout Brazil in the late 1800s and later planted throughout Latin America. COFFEA ARABICA VAR. BUGISHU (Coffea arabica var. bugisu) – A Coffea Arabica coffee plant varietal commonly called Uganda Bugishu Coffee and grown in northeast Uganda near Sipi Falls. Bugishu coffee is distinguished by its clean flavor and distinctive aroma. Some of the best Bugishu grows on Uganda’s Mt. Elgon in Uganda. A good brewed cup of Bugishu coffee exhibits the desirably winey acidity of a fine East African coffee. However, the lower complexity and lighter body of Ugandan coffee makes it generally less distinguished than the finer coffees of Zimbabwe, Tanzania, or Kenya. Also see Uganda Coffee; Uganda Bugishu Coffee. Catimor plants, which are known for their resistance to coffee rust (Hemileia vastatrix). When grown at low elevations Catimor coffee plants are not distinct from other commercial coffee varietals, but the Catimor plants grown at elevations above 4,000 feet exhibit a much higher quality. The Catimor varietal produces among the highest yields of commercial coffee plants. The cherry (fruit) mature early on the plants, and thus farmers cultivating Catimor plants must closely monitor the shade and fertilization. There are three main lines of Catimor, and each has different characteristics. The Catimor T-5175 line does not grow well at too high of an altitude or too low of an altitude, but otherwise it is a productive and very robust coffee plant. The Catimor T-5269 line grows well between 2,000 feet and 3,000 feet above sea level in places where rainfall reaches at least 3,000 mm each year. The Catimor T-8667 line has large seeds (coffee beans) as well as large cherry (fruit), though the plant itself is quite small. COFFEA ARABICA VAR. CATURRA – A Coffea arabica coffee plant varietal commonly called Caturra. The varietal Caturra is a mutation of the Bourbon varietal (Coffea arabica var. bourbon). Discovered in Brazil in the 1930s near the town of Caturra, the Caturra varietal was later planted in Latin America. Caturras are fast-maturing coffee plants and have good production. They are also better at resisting coffee plant diseases and pests than other Arabica varietals, though the coffee plants do require more extensive fertilization and care than many other Arabica varietals. The quality of the cup of brewed coffee produced by Caturra and other modern hybrids of Coffea Arabica is generally considered to be inferior to the more traditional varietals of Coffea arabica, known as the “old Arabica” varietals – Typica (Coffea arabica var. typica) and Bourbon (Coffea arabica var. bourbon). Caturra plants have an abundance of secondary branches and a relatively thick main stem. Caturra leaves, similar to Bourbon, are rather large and have wavy edges. Caturra plants are best suited to elevations ranging from 1,500 feet to 5,500 feet above sea level where rainfall amounts average around 3,000 mm per year, though Caturra plants grow well in a variety of conditions. The higher the elevation, the lower the production of the Caturra varietal, though the quality of the coffee beans increases with elevation. Caturra plants produce a higher yield than Bourbon plants, mostly because there is less distance between the plant’s branches. Genetically the Caturra varietal is quite similar to Bourbon, yet the quality and distinction of the brewed coffee is generally considered to be lower than Bourbon. The Caturra mutation also led to El Salvador’s Pacas varietal (Coffea arabica var. pacas) with Coffea arabica var. bourbon and Costa Rica’s Villa Sarchi varietal (Coffea arabica var. villa sarchi) with Coffea arabica var. bourbon. COFFEA ARABICA VAR. CATUAI – A high yielding Arabica coffee plant varietal commonly called Catuai. The varietal Catuai is a cross between two other varietals: Caturra (Coffea arabica var. caturra) and Mundo Novo (Coffea arabica hybrid mundo novo). Developed in the late 1940s in Brazil, the Catuai coffee plant is relatively short with lateral branches forming tight angles with the plant’s main branches. Catuai is a popular coffee plant varietal in coffee-growing areas that are often subjected to inclement weather because the Catuai cherry (fruit) do not fall off easily during winds and rains and winds, though they do require a fair amount of fertilization and care. The Catuai varietal may have yellow coffee cherry (Catuai-amarelo) or red cherry (Catuai-vermelho). COFFEA ARABICA VAR. CHARRIERIANA – Thought to be an Arabica Coffee varietal, Coffea arabica var. charrieriana is commonly called Charrieriana. The Charrieriana varietal was recently discovered in Cameroon and is not yet commercially cultivated, though it may soon gain a wide appeal due to its lack of caffeine. COFFEA ARABICA VAR. KENT – An Arabica coffee plant varietal commonly called Kent. The varietal Kent is known for its resistance to coffee rust and its propensity to provide a high yield. COFFEA ARABICA VAR. MARAGOGYPE (Coffea arabica var. maragogipe) – A Coffea arabica coffee plant varietal derived from the Typica varietal (Coffea arabica var. typica), and commonly known as Maragogype (pronounced MAH-rah-goh-SHZEE-peh) and known for its large coffee beans. The Maragogype varietal grows taller than both the Typica and Bourbon varietals, and grows best at elevations between 2,000 and 2,500 feet above sea level. The varietal Maragogype was discovered in northeast Brazil near the town of Maragogipe, which is in the state of Bahia. The plant’s seeds (coffee beans) are also known as Elephant Beans. The large Maragogype coffee beans are relatively porous and the yield of Maragogype is relatively low. The quality of the brewed coffee made from the Maragogype varietal, known to produce a light, nutty taste, is somewhat distinguished in particular coffee markets. The varietal is now cultivated in various countries including Central America, Peru and Mexico. COFFEA ARABICA VAR. MARIGOJIPE – A Coffea arabica coffee plant varietal commonly called Marigojipe. The varietal Marigojipe is a mutation of the Typica varietal and known to produce large coffee beans. Marigojipe was first discovered in Brazil’s Marigojipe region in the state of Bahia. The Marigojipe varietal is now grown throughout Latin America. COFFEA ARABICA VAR. MAYAGUEZ – A cultivar of Bourbon (Coffea arabica var. bourbon) cultivated in Rwanda and commonly called Mayaguez Coffee. Also see Rwanda Coffee.